Mickey’s Gary Remley (left) with an AmeriGas Location Manager. Over 1,200 AmeriGas location managers and corporate executives met with 25 invitation-only vendors to review forward-looking strategies and products at the company’s “Road Trip Conference & Trade Show” in August at the Omni Hotel in Dallas. 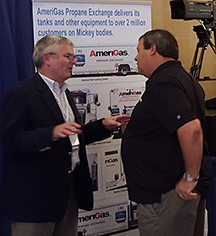 Tom Arland, VP, and Gary Remley, Regional Sales Manager, manned the Mickey booth talking shop to a “steady stream of visitors” about the new features on the AmeriGas truck bodies. The “Road Trip” also provided a forum for AmeriGas Field Managers and executives to discuss future innovations with their vendors. “They came to our booth with some excellent ideas on how we can make their drivers even more productive,” says Tom. Jay Massey, Corporate Fleet Vehicle Manager for AmeriGas Propane, spent considerable time in the Mickey booth working with Tom and Gary to discuss new ideas with the Location Managers.